There is nothing like the end of winter in Minnesota. I’m not from here. My roots are from Texas, but I’ve lived in Minnesota for nearly 40 years, so I know a thing about it—how the end of a long winter here contrasts to a “normal” end of winter in warmer places. Here, it is extreme. And profound. Yesterday, there were puddles in the street and it felt like a miracle had taken place. We’ve been long frozen. But this is not just about where I live. Many of us, from all over, have felt long frozen too. Life has been working us under the surface. I believe we can thank Jupiter in Scorpio (since October 2017) for that. Intense, extreme, profound transformation is brewing below the frozen surface. That surface could be understood as the overculture, systems of oppression, or unmoving forces that have kept us stuck. If that rings true for you, then this lunar cycle, which begins on February 15, is the beginning of a thaw. It could feel like a miracle. This New Moon is also a Solar Eclipse taking place on the threshold between Aquarius (fixed air) and Pisces (mutable water). That is to say the Moon and Sun come together in Aquarius but the Sun flows into Pisces just a few days later. The threshold between these signs reflects the thawing of concept into connection. We need Aquarius to feed the vision for what is possible. This fixed air sign imagines new worlds. We need these thinkers. But thought without empathy becomes disconnected abstraction. As Pisces follows, we learn to melt into empathy. To everything there is a season. If we stayed in the mind, visions become frozen and detached from our living reality. Pisces is here to thaw that process, to remind us that we can’t stay frozen. We need to thaw and let go of attachment to give birth to change. The Solar Eclipse adds to the need to remain fluid and adaptable as we navigate thresholds between form and fluidity. This eclipse is the mirror for the Total Solar Eclipse of August 2017, which was visible across the U.S. That eclipse activated late degrees of Leo, this eclipse activates late degrees in the opposite sign, Aquarius. I continue to watch how these eclipses will bring change to Trump’s fortunes since both eclipses are on his Ascendant/Descendant axis. There is a lot of uncertainty for him around selfhood and partnership. Eclipses can set us upon new pathways. Old pathways are suddenly dimmed, we can find ourselves on new trajectories. This isn’t a lunar cycle to try and hold on. It is time to melt. As we melt, we find ourselves flowing, merging, dissolving barriers, and opening to the next iteration of journey and change. But before we cross that threshold, let’s wait here between the worlds of Aquarius and Pisces. Let’s dream into our wildest imaginings. Let’s promise to be the change we want to see. And then prepare ourselves to surrender to what those visions and promises will bring. On a personal note. I will be traveling and teaching for much of this lunar cycle. I am going into uncharted territory myself, following my vision and purpose. I am excited to find what comes next in my work. The form of this forecast will dissolve for this lunar cycle, to be reborn in the next lunar cycle occurring between the thresholds of Pisces and Aries. Look for my lunar forecast to return when the Moon is waxing into fullness after March 17. What follows is an abbreviated look at the highlights of the coming lunation. 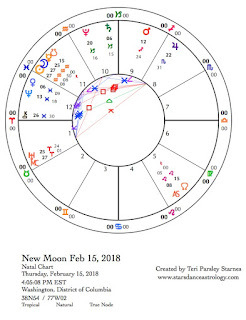 February 15—New Moon: Seeding. Solar Eclipse. Seeds are planted in the fertile uncertainty of a Solar Eclipse in Aquarius. Time to envision new worlds. Dare to break the mold. Jupiter in Scorpio widely squares the Sun and Moon. We can’t rest in our logical minds. Water—bringing with it memories of the past and a reanimation of passion—is seeping through our conceptual walls. True change brings soulful transformation with it. Mars in Sagittarius is making a square aspect to Neptune in Pisces (exact on February 17), influencing the journey to meaning and truth. Sometimes we have to take the meandering path to find the truth we seek. Water again is teaching us to flow more and grab less. Compassion and empathy are better ways to learn. If we are stuck on being right, Neptune creates a fog of self-doubt and confusion. When you feel those things, find ways to shift out of right/wrong thinking. Who says we are supposed to know where we are going? Sunday, February 18. Sun enters Pisces. Yesterday, Mars in Sagittarius made a square aspect to Neptune in Pisces reminding us to flow more and be certain less. Today, the Sun enters Pisces. That is a theme. Flow with emotion and shifting states of being. Sometimes we are right there, with the right amount of resilience and attention to be with others in empathy, and at other times we’ve reached the bottom of the barrel, there aren’t any more spoons to give. That is when you take care of yourself. Mars can help us monitor our energy. What feels enlivening? What regenerates compassion? February 19—Crescent Moon: Germinating. Contrasts between water and fire create the friction that provokes change this lunation. Today’s Sun in Pisces (mutable water) creates a challenging contrast to the Moon in Aries (cardinal fire). This friction helps us crack open into this phase of the lunar cycle. Now, we begin to create new patterns from our intentions. Under Aries influence, we can’t rest. In spite of ourselves we leap into new situations, even when we may not have enough energy to follow through till the end. The question becomes, How do you judge yourself when you stop putting energy into a beloved cause or commitment? How do you move forward with integrity while at the same time honoring your need to shift your focus? How do you handle imperfection? What is this self-judgment telling you about isolation and self-worth? Perhaps the biggest change we can embrace now is to have a different story about self-expectation. When we dare to be authentic, which includes imperfection, we find deeper connection. Wednesday, February 21. Venus conjoins Neptune in Pisces. Hearts have a tendency to be wide open under this influence. This can feel both wonderful and painful. We don’t necessarily get to choose what we open to. This lunation was seeded on the threshold between Aquarius and Pisces, giving us an opportunity to thaw our conceptualizations about things and flow into how our visions connect with and impact others on the emotional level. Boundaries are very porous right now. Careful communication can help us connect authentically and respectfully. But we need to open. Embrace the melting. An encouraging sextile aspect between Mercury in Pisces and Saturn in Capricorn helps us with communicating what is in our heart in an effective and realistic way. February 23—First Quarter Moon: Sprouting. To emerge from underground, we must risk failure. Be ready to experience failure as this lunar cycle reaches a turning point. The Moon in Gemini is trying all kinds of new things. Its influence is a bit scattered but also delightfully insouciant. Failure is part of change. Keep trying. Be experimental. The Moon is shaking up the strong Pisces influence upon this lunar cycle. We may have thought that empathy and connection meant something entirely different than what we are experiencing right now. What surprises you? If we remain, nimble, adaptable and delighted, we will find new ways to be together that can include our flaws. There is a possibility of being over-stimulated today. Find the quiet moments and spaces to reduce distractions. Sunday, February 25. Look for insight about the past, about what you need for healing, about how to remain fluid and connected to yourself and others. Mercury conjoins Neptune in Pisces. This influence could bring poetic revelations and mystical messages. The key is finding the right enviroment to support this newfound openess. Take care of your heart even as you risk feeling more. The Moon in Cancer boosts these watery emotions. Cancer is also about the hearth that can support openess and the vulnerability that comes with it. You may find yourself wanting to pay attention to family of blood and of choice. How do we support each other? How do we trust in mystery? An agitating but not negative influence comes from the square between Venus in Pisces and Mars in Sagittarius. Look for contrast and welcome the way it can help us trust each other more. Mars will protect the freedom to explore and believe something different. This can be a helpful contrast to all the Piscean influence that encourages non-differentiation. We pulse back and forth like a breathing being. February 26—Gibbous Moon: Budding. The influence of yesterday’s peak transits influence the adjustments we are making in our lunar intentions. It is my belief that each lunar cycle is about growing something new, even when we do not consciously choose it. So what is preparing to blossom in you right now? Likely, you’ve had some pretty big revelations recently. Be tender with yourself. This thawing can release memories and even trauma. Even if those things don’t happen, being softer could be a whole new experience for you. How can you support your heart to remain soft? The Moon in Cancer contacts Pluto in Capricorn and Uranus in Aries to create some agitation. The source of conflict could be around power and/or how to create change. We keep taking care of ourselves and each other, even through the bumps. 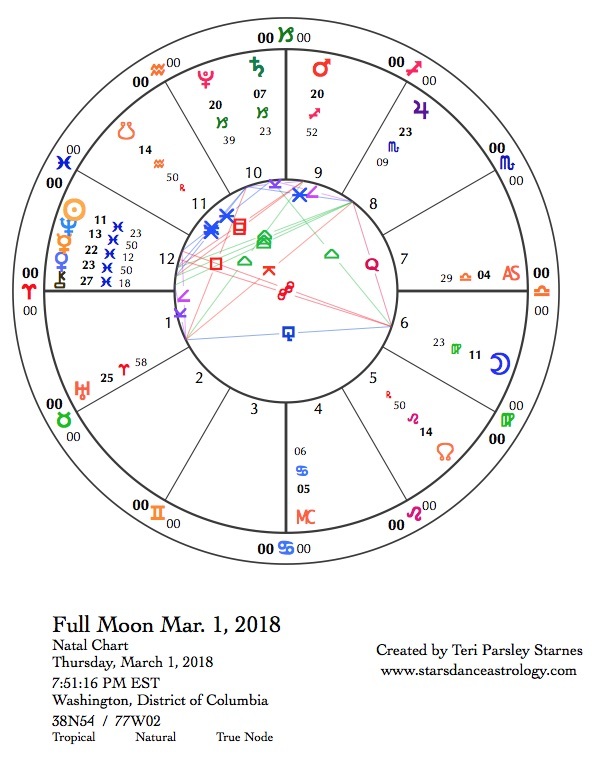 March 1—Full Moon: Blossoming. If this lunar cycle was about thawing rigid mental structures so we could merge into interconnection, then we are feeling really squishy right now. And maybe a little foggy. There are metaphorical puddles everywhere. The Virgo Moon is here to help us reestablish order and perspective on what we have experienced thus far. Thank goodness we can figure out how to make our revelations and connections more sustainable and pragmatic. That is a good thing. Really. And it still won’t be easy. The Sun conjoins Neptune in Pisces and just for good measure Venus and Mercury conjoined in Pisces are square to Mars in Sagittarius. Lots of confusion in relationship and communication could spark anger. So, let’s remember why we want to soften, while at the same time honoring that a little structure could be supportive of that intention. A Full Moon is a culmination. It can be a breakthrough too. How will this breakthrough help us as we move forward? Why do we need softer heart connections? What are we being called to do? Sunday, March 4. This is another peak day of the lunar cycle. The Sun conjoins Neptune in Pisces and Mercury, Venus, and Chiron make a triple conjunction in Pisces as well. There is so much Pisces influence that, no doubt, we ARE reading each others’ minds. People who can pick up on what others are feeling need to do a lot of self-care to maintain their own well being. To be a healer, we need to receive healing. To be empathic, we need good boundaries. Good boundaries are always under construction. It isn’t as if there is a blueprint, we put them up and then we get to move on with our lives. That kind of boundary is more like a prison anyway. Look at boundaries today. Notice what is working and what isn’t. Be willing to negotiate. The Libra Moon is all about that. March 5—Disseminating Moon: Fruiting. What are we learning about thawing and softening? What are we learning about boundaries and healing? What are we learning about care for our past traumas? What are we learning about interconnection? Under this phase of the Moon we are able to compile the lessons learned and begin to wonder about which ones are the most valuable. Tomorrow, energy shifts quite a bit when Mercury and Venus both leave Pisces to enter Aries. Thawing leads to new grow. The ground is prepared for new life. Ready to leap? Thursday, March 8. Jupiter in Scorpio stations retrograde. We’ve only experienced the first act of Jupiter’s travels through this transformative sign. The first act included #metoo. The first act included more willingness to look below the surface and call out abuse and toxicity. The first act cleared the way for the second act: Jupiter moving back over the same ground, deepening and cleansing what didn’t get done the first time. Jupiter remains retrograde till July 9. Go deeper and be healed. 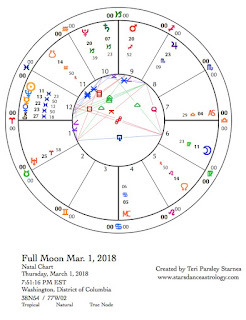 March 9—Last Quarter Moon: Re-seeding. Yesterday’s station of Jupiter in Scorpio influences where we go next in this lunar cycle. We aren’t meant to be satisfied with surface changes in ourselves or the world. We are ready to dig deeper into dissatisfaction and desire for a more alive and passionate existence. These new seeds, the ones created by this lunar cycle, now fall on softened ground. We are ready. March 13—Balsamic Moon: Composting. Perhaps we learned how to let go a little bit better this lunar cycle, which was so heavily influenced by the Pisces experience. As the Moon wanes, we may return to the desire for solitude and restoration. The Moon in Aquarius reminds us of the mental dams we’ve burst through this lunar cycle. There is a temptation to return to mental process alone to find our answers. How do we merge the mind with the heart? That may be the real lesson of this cycle. Thursday, February 1. The threshold between fire and earth is crossed today. It is a small thing when the Moon changes signs. It happens every 2 and a half days, but if we pay attention, we notice that every time that happens, we cross a threshold. Our bodies are experiencing fluid change. In the U.S. time zones, the morning is about fire. We are still feeling the vestiges of yesterday’s Full Moon in Leo. This is big energy about identity and self worth. Leo infuses the Self with life force energy. Perhaps you are feeling a little overwhelmed or burnt out. The threshold to earthy Virgo could feel like a downer or a needed respite from so much energy. What are you noticing? This is the pulsation of the zodiac fire always leads to earth. Expansion always lands back on the ground where we ask ourselves, how do we make this sustainable? What do we need to attend to in our physical lives? Friday, February 2. Traditional Imbolc. Brigid, the Goddess associated with this Celtic holy day, holds the power of inspiration, poetry, smithcrafting, and healing. At Imbolc, we offer Her our promises and intentions for the year. She blesses our beginnings. The Virgo Moon supports intentions that center on healing, service, and devotion. Early in the day an opposition between the Moon and Neptune in Pisces helps us tap into empathy if we are willing to let go of perfection. Imagine the yes/and approach to the seeming polarity of pragmatism vs. mysticism. Merging these qualities helps us set intention that serves the greater good. Let us invoke healing. February 3—Disseminating Moon: Fruiting. Astronomical Imbolc. Some Pagans celebrate the Cross-Quarter Sabbaths (or Holy Days) on traditional dates handed down to us by the Christian church. Other Pagans observe these moments at the mid-point of the Fixed signs, which are close to the traditional dates. Traditional Imbolc is sometimes celebrated on February 1 and sometimes February 2, but the astronomical date for Imbolc is today, when the Sun reaches the mid-point of Aquarius (Fixed Air sign). The mid-point of the Fixed signs are the mid-points of the seasons as defined by the ingress of the Sun into Cardinal signs at the Solstices and Equinoxes. They are potent anchors to the wheel of the year. Aquarius anchors Winter. This is the time to dive deep into Winter’s mysteries to receive vision for the coming year. Winter and the dark are intimates whose conversations inspire our hearts to envision our gardens, begin new projects, and initiate new magic. At the Disseminating phase of the Moon our visions are also influenced by the fruits of this particular lunar cycle. 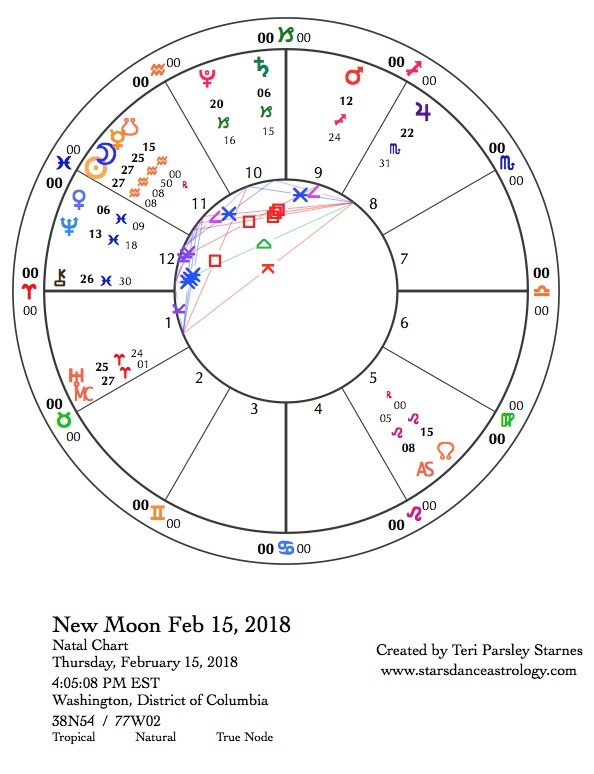 What are you receiving now from the journey that began at the New Moon on January 16? During this lunar cycle, I’ve been paying attention to the connection between lineage and present choices. I’ve also been doing personal spellwork around identity. The recent Leo Full Moon eclipse is still reverberating, telling me I can choose a different relationship to myself and that I have allies in my ancestors and in my teachers who honor their lineage. When I think back to those who have worked and offered wisdom to make my present choices possible, I am humbled. If there is any merit to my journey so far, I offer that fruit back to those who are helping me now. This feels less like an heroic journey of conquest and more like a seeker’s journey of remembering. The Moon in Libra encourages balance and reciprocity making the desire to offer back what we are receiving even stronger. Mercury in Aquarius makes an encouraging sextile aspect to Mars in Sagittarius. We are seeking truth. We are feasting upon the inspiration of mid-winter. This connection strengthens the intention-setting appropriate to this time of year. Mercury’s influence may loosen our tongues. Offer a prayer/poem to the dark, the stars, and the growing light. Sunday, February 4. Squares are challenging relationships between planets. Today, Venus in Aquarius makes a square aspect to Jupiter in Scorpio. Sometimes the question to ask with a square is what could possibly go wrong? A connection between Venus and Jupiter can often be pleasurable. But because it’s a square, we might wonder what could go wrong when two fun-loving planets interact? Maybe too much fun? Maybe a harder time drawing the necessary boundaries to ensure that pleasure is mutual or not depleting in some way? Maybe a miscommunication between differing desires? Squares invite us to make adjustments. Perhaps we use this opportunity to return to a relationship size that feels life-affirming and truly pleasurable. Another square influences the day: The Moon in Libra makes a square to Saturn in Capricorn. What could go wrong between a desire to please and harmonize and a desire to judge and hold accountable? What is the adjustment you need to make? Moon enters Scorpio 9:56 pm CST. Monday, February 5. It is hard to keep harmonizing when so much chaos and toxic people are around you. That is how it feels today with the Moon in Libra opposing Pluto in Capricorn and making a square to Uranus in Aries today. This might not be the best way to start a workweek, but there you have it. One piece of wisdom about balance: It isn’t static, and it doesn’t mean we have to fix everything to make it better. We just need to be flexible enough to adjust in the moment around our own centers. Ninja. Tuesday, February 6. There is something about the opening lines to Mary Oliver’s poem, “Wild Geese,” that feels appropriate for today, “You do not have to be good. You do not have to walk on your knees for a hundred miles through the desert, repenting.” The Moon is in Scorpio. Finally, we get to be bad. If any recent attempts at “goodness” have felt artificial to you, feel free to let that go. We do not have to be good. A boost to authenticity comes from the delightfully unconcerned Venus in Aquarius sextile to Uranus in Aries. Be yourself, and look around at how attractive others are who are being themselves too.